Author: Marlene Cooper, Joan Granucci Lesser Ph.D.
Acknowledged author Marlene Cooper wrote Clinical Social Work Practice: An Integrated Approach with Enhanced Pearson eText -- Access Card Package (5th Edition) (Advancing Core Competencies) comprising 252 pages back in 2014. Textbook and etextbook are published under ISBN 013388466X and 9780133884661. 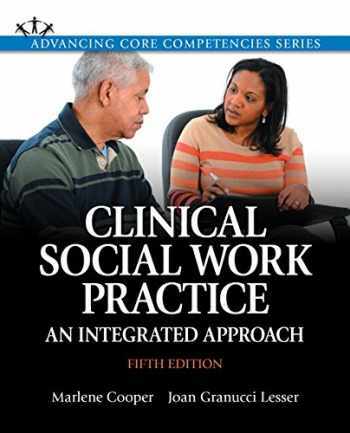 Since then Clinical Social Work Practice: An Integrated Approach with Enhanced Pearson eText -- Access Card Package (5th Edition) (Advancing Core Competencies) textbook was available to sell back to BooksRun online for the top buyback price of $42.30 or rent at the marketplace.